The Indians are four games behind the other three teams in the North Division with 12 games to play in the first half. Indians righty Tai Teidemann (1-2, 3.50) faces RHP Zach Mort (0-0, 0.00) tonight. 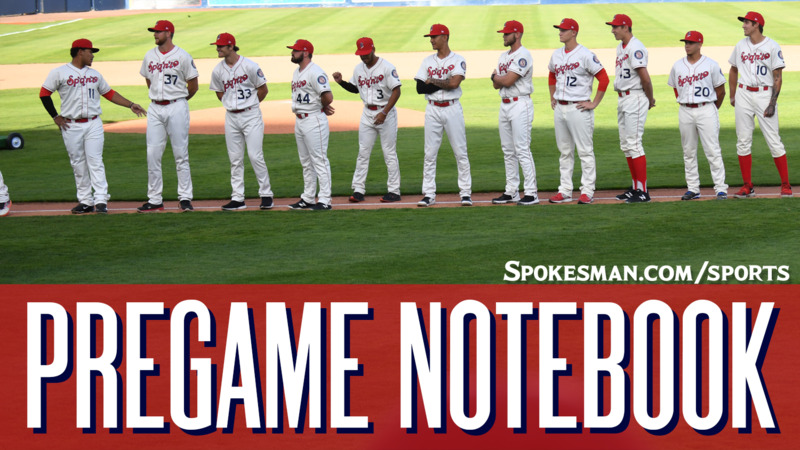 Tiedemann makes his fifth start this season for Spokane. He has pitched to a 1.39 WHIP over 18 innings with 15 strikeouts. Mort is making his second start for Eugene. The Chicago Cubs eighth round pick in this year’s MLB Draft out of George Mason threw two innings in his pro debut and gave up one hit with two strikeouts. Biggers joins Indians: Texas Rangers eighth-round draft pick shortstop Jax Biggers joins the team after one game with the Arizona League Rangers earlier this week. Biggers hit .280/.388/.382 with four homers, 26 RBIs and seven stolen bases his recently-completed junior season. Biggers is getting a little later start than most 2018 draft picks as his Arkansas team went all the way to the College World Series title game, falling to Oregon State 5-0 on June 28. “Yeah, it’s been pretty busy,” Biggers said on Thursday. Even though the Razorbacks didn’t win the title, Biggers said the experience was invaluable. He signed with the Rangers on July 3 for $166,400, pushing the club over its allotted bonus pool of $7.356 million – triggering the MLB’s draft luxury tax penalty. Biggers said he didn’t put much thought to returning to Arkansas for his senior season, saying he had his mind “pretty much made up” before the draft. Lineup: 1) CF J.P. Martinez; 2) SS Jax Biggers; 3) 3B Diosbel Arias; 4) LF Jonah McReynolds; 5) DH Curtis Terry; 6) 2B Cristian Inoa; 7) RF Starling Joseph; 8) 1B Hasuan Viera; 9) C Scott Kapers. Last night: Hasuan Viera drew a bases loaded walk to force in a run in the eighth inning and the Indians (9-17) came back from a 7-1 deficit to edge the visiting Emeralds (9-17) 8-7 on Wednesday. Starling Joseph cranked a three-run homer (2) in the seventh to tie it at 7-7 and J.P. Martinez (3) added a two-run shot in the sixth. Starter Jake Latz allowed seven runs on five hits, including a home run, and four walks. Reliever Warner Leal provided three shutout innings with four strikeouts and Emmanuel Clase had a 1-2-3 ninth with a K for his third save. Transactions: SS Jax Biggers (8th round 2018/Arkansas) assigned to Spokane. INF Obie Ricumstrict assigned to AZL Rangers. Promotion: Pregame Youth Clinic courtesy of LEO’s Photography (3:30-5:30pm). Also, buy a hot dog and look inside the wrapper for a chance to win cash and great prizes. Weather: Game time – Sunny, 90. Final out – Clear, 74. Published: July 12, 2018, 4:40 p.m. Updated: July 12, 2018, 5:49 p.m.